Protect your vehicle from the elements. Contact the Markley Honda Service Department today and have one of these popular Vehicle Protection Packages installed on your vehicle. You can even have it added to your new Honda car, SUV, or truck when you purchase your vehicle. Our customers love the custom look that window tinting offers their new vehicle. Plus, the tinting helps to reject heat away from the vehicle, a must during the hot summers we get here in Fort Collins. Glare reduction and harmful UVA and UVB rays that harm the interior of your car will also be cut down when you install window tinting. When it comes to improve the appearance of your vehicle as well as protecting the interior, there’s no better investment than window tinting. Our installers are 3M Certified. Ask about the ColorStable Guarantee. Clear Nosemask Paint Protection from 3M is a premium-grade, clear-coated, urethane film that protects your new Honda vehicle from damaging road debris when applied on high impact painted vehicle surfaces. The film keeps vehicles looking great, significantly reduces paint chips and bug damage, and helps boost trade-in value. Protect and seal your Honda vehicle’s exterior from weather and more —included fading & loss of gloss, acid rain & tree sap, and permanent hard water etching & industrial fallout — with our paint sealant. Keep your interior looking it’s best with our fabric sealant, that repels water & oil based stains, contains inhibitors to retard fading, extends the life of fabric & carpet and makes clean up easy! We also have a vinyl and leather sealant available. These sealants create a barrier against stains, protects against premature aging and helps to retain the natural softness of the material. Weather is a major part of our everyday lives here in Colorado. It also plays a role in the life of your new Honda vehicle too. Fortunately, we offer a protection package that’s perfect for your busy Colorado lifestyle. 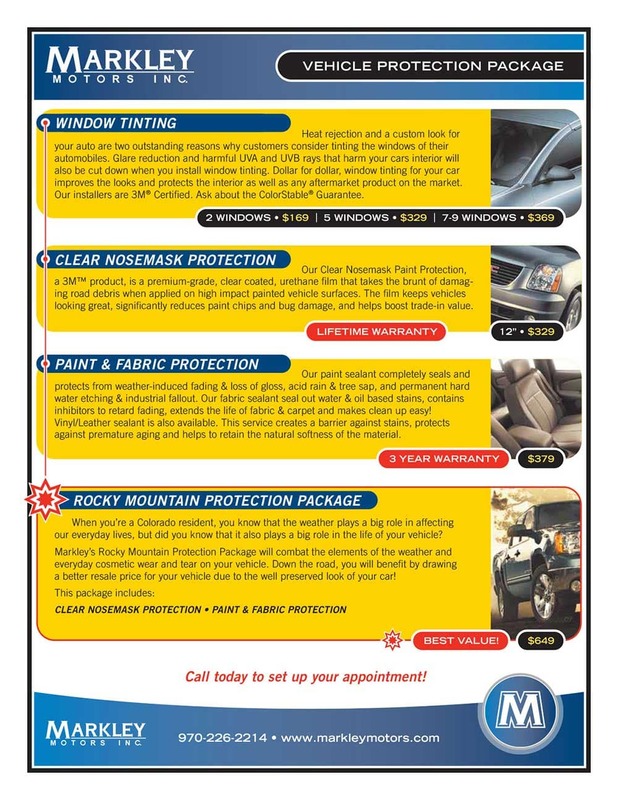 Markley’s Rocky Mountain Protection Package combats the elements of the weather and everyday cosmetic wear and tear on your vehicle. Later, you will benefit by drawing a better resale price for your vehicle due to the well-preserved look of your car!